Carpal Tunnel Surgery? Ouch! Is Surgery for Carpal Tunnel in your future? Deciding whether or not to have Carpal Tunnel Surgery is a complex process. It's a matter of finding and knowing the right information. And really, you have to trust someone. We trust our doctors to know best. And sometimes that works out great. If I ever get into a car accident, without a doubt I want a doctor and hospital staff to take care of me. If I had Carpal Tunnel Syndrome......not so much. Why get an invasive, potentially dangerous surgery when there are other safer, more reliable methods? That just one motivation I've had to learn how to fix CTS. I've personally had all the Carpal Tunnel Syndrome Symptoms before, multiple times, and I've worked with thousands of wrists suffering from Carpal Tunnel Syndrome over the last decade. I can quickly make my own symptoms vanish if I get them, but more importantly, I have yet to work with anyone whose wrists have not improved significantly, even in EXTREME cases. Even people that were still suffering from pain -after- having surgery got better. Twice I have experimented with doing a lot of hands-on massage and letting my hands and wrists get really bad. Numbness and tingling, pain in my fingers, wrist, and, forearms, elbow, and shoulders. With some trial and error the first time, and then quickly the second time, I was able to get myself totally out of pain and back to having a happy, healthy structure. And of course I've worked with a lot of clients in my office, and reducing symptoms is fast and easy. It's just a matter of opening up too tight and constrictive tissue in the right places. It's definitely not the only option. It IS the 'final' option that doctors will suggest after their other suggestions of rest, anti-inflammatories, splints and braces, corticosteroid shots, etc, all failed. If they were wrong about those, why would you expect them to be right about surgery? You should definitely Quiz Your Doctor when having the conversation about whether to have carpal tunnel surgery or not. Can I fix my Carpal Tunnel Syndrom without surgery? -IF- you take the right steps. Granted, you have probably been hurting longer than I was, and the longer you are in pain, the more established the Carpal Tunnel Dynamic becomes. Having said that, it is NEVER to late to reverse Carpal Tunnel Syndrome. I've worked with people that have had CTS for decades, whose doctors tell them they have 'permanent' nerve damage. In one session, their symptoms are greatly reduced. In a couple more, gone. Sometimes the numbness takes a while to fade, but for the most part, it's just a matter of taking the foot off the hose. Carpal Tunnel Syndrome Surgery would have hurt me more than it would have helped me. Admittedly I'm biased because I only work with people whose surgery didn't go well or reduce their symptoms. You can definitely reverse Carpal Tunnel Syndrome, but you can -never- reverse Carpal Tunnel Syndrome Surgery. If the surgeon hits a nerve, that's a one way street. If you get surgery but all your symptoms are from Vitamin B6 insufficiency, then that's a lot of trauma from a surgery that has zero chance of helping. Let's just assume that you have gotten a Carpal Tunnel Diagnosis. You aren't officially a candidate for surgery without one of those. If the source of the problem, if the ONLY point of problem, was at the carpal tunnel, then I would say "Yes, go ahead and get carpal tunnel surgery, no reason not to." Unfortunately, that is not how Carpal Tunnel Syndrome works. Unless you are one of the statistical anomalies that has a genetically malformed or a just plain too-small-for-no-reason carpal tunnel, you have an entire Carpal Tunnel Syndrome Dynamic of tightness, shortness, and pain from your upper back and neck all the way to your fingertips. Some wrist pain can be caused by issues like tumors, diabetes, water retention from being pregnant, bruising wounds to the wrist area, etc. Since you are almost certainly a person with 'normal' physical anatomy of the wrist, it is good to ask yourself a question. "If the connective tissue around my carpal tunnel is not the Source of my problem, how will having surgery on it help?" It may help for a little while, as it will likely, temporarily, release immediate pressure on the median nerve. Some people do get long term benefit, but the more you look into it, the iffier it gets. I've never heard of anybody with a 'successful' surgery be back to a totally pain free, pre-surgery state of wrist health. Surgery does not address the rest of the Carpal Tunnel Syndrome Dynamic. It does not alter your posture, does not free up other sites of compression of the nerves that feed the arm and hand, does not reduce muscle tightness in the overall limb structure. It does not get rid of Inflammation. It does not reverse the Pain Causing Dynamic. In fact, surgery makes it all worse. When the body is cut, the body heals itself by laying down scar tissue and 'knitting' the structure back together. Meaning, it pulls everything together to make a tight seal. So let's think about that and how it relates to carpal tunnel release surgery for a moment..... 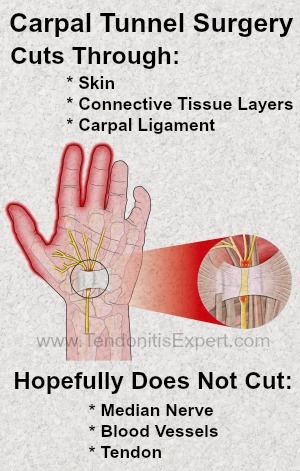 If the skin, muscle, and connective tissue of the wrist is 'too tight' and compressing the median nerve in the carpal tunnel, and a surgeon goes in and slices through that tissue, what is going to happen? Scar tissue is going to lay down, and pull all the affected tissue together, tightly. And the body is going to react to the injury that Carpal Tunnel Surgery causes. The way it does this is by making you hurt more (inflammation) and tightening muscles to protect you (guarding). Ultimately things will continue their path of getting tight and problematic again. Here's just one example of a common result of carpal tunnel surgery: Carpal Tunnel Syndrome surgery april 2010 wonderful at first now severe pain and burning. Thus, it's fun to look at statistics. The pro-surgery camp will give you statistics that surgery is -very- effective for Carpal Tunnel Syndrome. The anti-surgery camp will give you statistics that show it to be -very- not effective. Take a look for yourself at a small collection of Carpal Tunnel Surgery Statistics and studies. Regardless, surgery is (well, it should be ) a last ditch activity, reserved for life and limb threatening situations. That depends on whether you want to get Carpal Tunnel Surgery or not. It also depends on the information you find and whether it has led you to discover a better option. If you are facing surgery and you live in the San Francisco Bay Area, I could prove to you in 15 minutes that there is an effective alternative. If we aren't in the same area, you may want to experiment. Try what I suggest on these web pages and see how much that takes the pain away. If you actually do it as I describe, you will get results. In some severe cases surgery is a good and necessary thing. In my experience, the vast majority of cases can be dealt with without surgery (if you know what to do or are working with somebody that has the skills to 'fix' the problem). Here are some common sense reasons arguing against getting surgery 'just because' the doctor advises. As I said previously, sometimes surgery is a good and necessary thing. There's probabably a few other scenarios, like a cancerous growth, but for the most part, that's it. There ARE effective alternatives that actually deal with your wrist pain. You may have noticed that I'm a bit biased against Carpal Tunnel Surgery. I'm actually not. CTS is NEVER as simple as 'that one little spot right there is too tight for no particular reason'. Tere are always one or more reasons responsible for compression, and cutting on that one spot doesn't help those reasons. If you have already had surgery, or are about to and are committed to going through with it, then you may want to learn about how to make Carpal Tunnel Surgery Recovery as fast and complete as possible. Return to the top of this this page.